With the launch of the Yaogan 28, Yaogan 29 in November 2015 and Yaogan 30 satellite in May 2016, China has demonstrated its ability to routinely identify, locate and track an Aircraft Carrier Group (ACG) on the high seas. 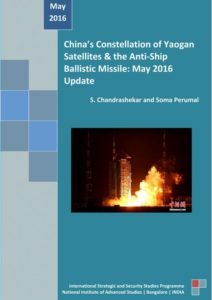 This space capability is an important component of an Anti-Ship Ballistic Missile (ASBM) System that China has set up. The current operational satellite constellation consists of ELINT satellites, satellites carrying Synthetic Aperture Radar (SAR) sensors as well as satellites carrying optical imaging sensors. Yaogan 23, Yaogan 29, Yaogan 10, and Yaogan 18 are the satellites carrying a SAR sensor. With Local times of crossing of 02 00, 04 30, 06 00, and 10 00 hours they provide all weather as well as day and night imaging capabilities over the regions of interest. Yaogan 30, Yaogan 26, Yaogan 4, Yaogan 24, Yaogan 28, Yaogan 7 and Yaogan 21 constitute the high resolution optical satellites in the current constellation. The sensors they carry may have resolutions of between 1 to 3 m. Their local times of crossing of 09 00, 10 30, 11 00, 13 30, 14 00, 15 00 and 17 30 hours respectively ensure favourable illumination conditions for their imaging missions. Yaogan 27, Yaogan 19, Yaogan 22 and Yaogan 15 satellites with local times of crossing of 09 30, 10 30, 13 30 and 14 30 hours respectively are optical imaging satellites with medium resolution (3 to 10 m) capabilities. They act as a broad area coverage complement for the SAR as well as the high resolution optical imaging satellites. Yaogan 27 is a replacement for the Yaogan 8 that may be nearing the end of its life. Using typical sensor geometries and the two line orbital elements available from public sources the ability of the current constellation to identify, locate and track the ACG was simulated. Assuming that any three of the ELINT clusters are operational at any given point in time the ELINT satellites typically make 18 contacts in a day with the moving target. The maximum period for which the target remains outside the reach of the ELINT satellites is about 90 minutes in a day. The SAR and the optical imaging satellites together typically provide 24 satellite passes over the target. About 16 targeting opportunities, during which the uncertainty in the target’s location is less than 10 km, are available in a day. The analysis and the simulation results suggest that China has in place an operational ASBM system that can identify, locate, track and destroy an Aircraft Carrier in the Pacific Ocean. This seems to be an important component of a larger Chinese Access and Area Denial Strategy focused around a conflict over Taiwan.